The Romans never had a written constitution, but their form of their government, especially from the time of the passage of the lex Hortensia (287 B.C. ), roughly parallels the modern American division of executive, legislative, and judical branches, although the senate doesn’t neatly fit any of these categories. What follows is a fairly traditional, Mommsenian reconstruction, though at this level of detail most of the facts (if not the significance of, e.g., the patrician/plebian distinction) are not too controversial. 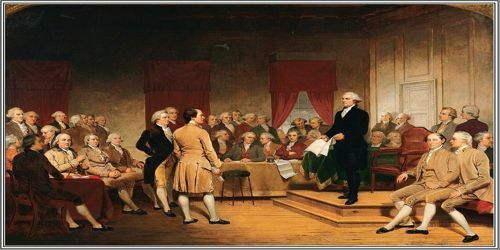 One should be aware, however, of the difficulties surrounding the understanding of forms of government (as well as most other issues) during the first two centuries of the Republic. Collegiality: With the exception of the dictatorship, all offices were collegial, that is, held by at least two men. All members of a college were of equal rank and could veto acts of other members; higher magistrates could veto acts of lower magistrates. The name of each office listed below is followed (in parentheses) by the number of office-holders; note that in several cases the number changes over time (normally increasing). Annual tenure: With the exception of the dictatorship (6 months) and the censorship (18 months), the term of office was limited to one year. The rules for holding office for multiple or sucessive terms were a matter of considerable contention over time. CONSULS (2): chief civil and military magistrates; invested with imperium (consular imperium was considered maius (“greater”) than that of praetors); convened senate and curiate and centuriate assemblies. PRAETORS (2-8): had imperium; main functions (1) military commands (governors) (2) administered civil law at Rome. AEDILES (2): plebian (plebian only) and curule (plebian or patrician); in charge of religious festivals, public games, temples, upkeep of city, regulation of marketplaces, grain supply. QUAESTORS (2-40): financial officers and administrative assistants (civil and military); in charge of state treasury at Rome; in field, served as quartermasters and seconds- in-command. TRIBUNES (2-10): charged with protection of lives and property of plebians; their persons were inviolable (sacrosanct); had power of veto (Lat. “I forbid”) over elections, laws, decrees of the senate, and the acts of all other magistrates (except dictator); convened tribal assembly and elicited plebiscites, which after 287 B.C. (lex Hortensia) had force of law. CENSORS (2): elected every 5 years to conduct census, enroll new citizens, review roll of senate; controlled public morals and supervised leasing of public contracts; in protocol ranked below praetors and above aediles, but in practice, the pinnacle of a senatorial career (ex- consuls only) — enormous prestige and influence (auctoritas). originally an advisory board composed of the heads of patrician families, came to be an assembly of former magistrates (ex-consuls, -praetors, and -questors, though the last appear to have had relatively little influence); the most powerful organ of Republican government and the only body of state that could develop consistent long-term policy. enacted “decrees of the senate” (senatus consulta), which apparenly had not formal authority, but often in practice decided matters. took cognizance of virtually all public matters, but most important areas of competence were in foreign policy (including the conduct of war) and financial administration. all 3 assemblies included the entire electorate, but each had a different internal organization (and therefore differences in the weight of an individual citizen’s vote). all 3 assemblies made up of voting units; the single vote of each voting unit determined by a majority of the voters in that unit; measures passed by a simple majority of the units. called comitia. specifically the comitia curiata, comitia centuriata, and comitia plebis tributa (also the concilium plebis or comitia populi tributa). CENTURIATE ASSEMBLY: most important; units of organization: 193 centuries, based on wealth and age; originally military units with membership based on capability to furnish armed men in groups of 100 (convened outside pomerium); elected censors and magistrates with imperium (consuls and praetors); proper body for declaring war; passed some laws (leges, sing. lex); served as highest court of appeal in cases involving capital punishment. 118 centuries controlled by top 3 of 9 “classes” (minimum property qualifications for third class in first cent. B.C.-HS 75,000); assembly controlled by landed aristocracy. TRIBAL ASSEMBLY: originally for election of tribunes and deliberation of plebeians; units of organization: the urban and 31 rural tribes, based on place of residence until 241 B.C., thereafter local significance largely lost; elected lower magistrates (tribunes, aediles, quaestors); since simpler to convene and register 35 tribes than 193 centuries, more frequently used to pass legislation (plebiscites). 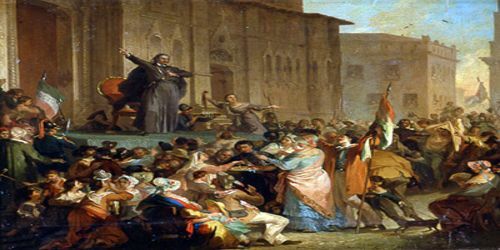 Voting in favor of 31 less densely populated rural tribes; presence in Rome require to cast ballot: assembly controlled by landed aristocracy (villa owners). Eventually became chief law-making body. < criminal and civil — BRANCH>Civil litigation: chief official-Praetor. The praetor did not try cases but presided only in preliminary stages; determined nature of suit and issued a “formula” precisely defining the legal point(s) at issue, then assigned case to be tried before a delegated judge (iudex) or board of arbiters (3-5 recuperatores for minor cases, one of the four panels of “The one hundred men” (centumviri) for causes célèbres (inheritances and financial affairs of the rich)). Judge or arbiters heard case, rendered judgment, and imposed fine. Criminal prosecution: originally major crimes against the state tried before centuriate assembly, but by late Republic (after Sulla) most cases prosecuted before one of the quaestiones perpetuae (“standing jury courts”), each with a specific jurisdiction, e.g., treason (maiestas), electoral corruption (ambitus), extortion in the provinces (repetundae), embezzlement of public funds, murder and poisoning, forgery, violence (vis), etc. 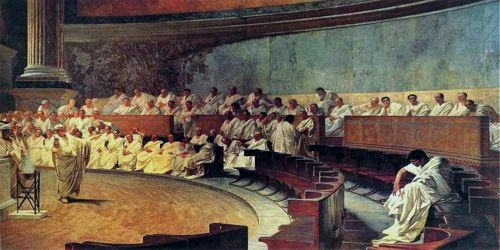 Juries were large (c. 50-75 members), composed of senators and (after the tribunate of C. Gracchus in 122) knights, and were empanelled from an annual list of eligible jurors (briefly restricted to the senate again by Sulla).